I'd very much like to start some discussion about Rachmaninoff and the many types of player piano which he and his music encountered. A year or two ago, I wrote the piano roll section of the Rachmaninoff article on Wikipedia, but there is still a lot of misinformation on the web about these instruments. This is far too large a topic to cover in one posting, but I'll make a start. Let's begin with the normal player piano, the one that needs to be pedalled and controlled with the utmost subtlety, but the one of which almost every YouTube video you can find is a heinous travesty! There were Pianolas in Russia from roughly 1899 onwards. 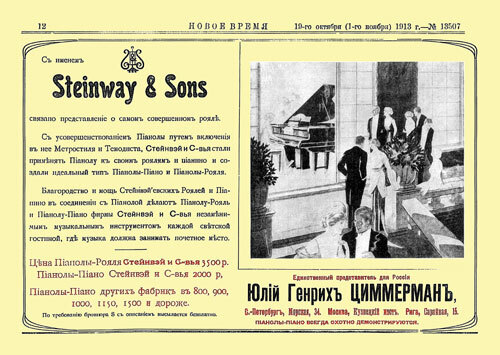 In 1913, the main agency, Julius Heinrich Zimmermann, had branches in St Petersburg, Moscow and Riga, as this Cyrillic advertisement for the Pianola Piano confirms. Pianolas are not so well-known today, but in the decade before the First World War they were facets of everyday life for the well-to-do. Rachmaninoff's sister-in-law, Sofia Satina, apparently remembered him pedalling through rolls of the Second Piano Concerto on a Pianola Piano at Ivanovka. The source for this seems to be Miss Satina's reminiscences, which are deposited at the Library of Congress, but I have not managed to see the original. They are quoted by Greg Benko in the complete RCA edition of Rachmaninoff's recordings on LP, but Benko mistakenly assumes that the rolls were recorded by Rachmaninoff himself, for some obscure German firm, and subsequently lost. In fact, it is much more likely that they were the three-roll set published by the Aeolian Company in London around the end of 1909. At that time the Rachmaninoffs were alternating between Ivanovka and Dresden, and the Aeolian Company had opened new showrooms in Dresden in the summer of 1907. One can no longer prove these things, but as a well-known musical figure, it is highly likely that Rachmaninoff would have been invited to the opening of Aeolian Dresden, which would have included some form of recital hall. The Aeolian Company's concert halls around the world were very fashionable, and, for example, in Manhattan, the New York Symphony made its home at the Aeolian Hall on West 42nd Street. By 1914, Aeolian in London had published not only the Second Piano Concerto, but also the Isle of the Dead, arranged by Otto Taubmann, the Variations on a Theme of Chopin, the first six of the Op. 23 Preludes, accompaniment rolls for the Cello Sonata, all of Op. 3, some of the Morceaux de Salon and Moments Musicaux, Ops. 10 and 16, one song accompaniment and Rachmaninoff's four-hand arrangement of the Waltz from Sleeping Beauty. All these rolls were not of the recorded variety, but were transcribed from the score by musically trained editors. The intention was to provide only the notes, deliberately leaving the interpretation to the player at home. These rolls are not all as rare as you might think. I have most of them, and I am far from being the only person who has the set of the Concerto, for example, though it must be said that the Isle of the Dead doesn't turn up very frequently. Speaking as a musician myself, the rolls of the Second Piano Concerto are, in my view, the most sensitive concerto arrangement that Aeolian ever achieved, and it is certainly possible that Rachmaninoff advised on their production. There are written records of Stravinsky working with Aeolian on their Pianola rolls of the Rite of Spring, and the 7-roll set of Ravel's Daphnis and Chloe contains passages which vary from the normal four-hand arrangement in ways that only the composer would have had the authority or the imagination to suggest. I'm curious to know whether any indoor photographs of Ivanovka still exist, other than the odd well-known ones. Is there one with a player piano in the background, for instance? Are there museums or archives in Russia which have documents or early magazine articles about Rachmaninoff and the Pianola? Rolls for the normal player piano continue to be made in small quantities, and I have myself transcribed the Paganini Rhapsody, the Third Piano Concerto and the Second Two-Piano Suite. A very dear, late friend of mine transcribed both the 1913 and the 1931 versions of the Second Piano Sonata, and between the wars a well-known British photographer, Frederick Evans, put the Variations on a Theme of Corelli on to roll. That will certainly do for one posting! I can't legally post Rachmaninoff's music to the web myself, but the website at Pianostreet has a copyright agreement, so if you want to hear a reasonable stab at a normal piano roll of Rachmaninoff's music, try this version of the Paganini Rhapsody, which I recorded in the late 1990s. You'll have to click the appropriate button. Last edited by pianola on Sat Jul 07, 2012 12:18 pm, edited 1 time in total. Thanks for your post - I know this recording very well from Rex Lawson's cd The Virtuoso Pianolist (I suppose you are Rex - I am Aspergershawn from another site on which we exchanged messages). I like to hear the two piano versions of works such as the Paganini Rhapsody - I am going to perform that work this year, and I am going to have someone at the second piano to play the orchestra part. Maybe I should make it really fun and have a pianolist accompany - the audience can decide who is the more human the musician, I the soloist or the accompanying pianolist!! Can you tell me about variation 15 (the jazzy quasi-improvisatory extended solo variation - the final 4-octave two-handed arpeggio on the half-diminished supertonic chord is rhythmically stretched out - I know that the pianolist could have played that with superhuman velocity (as Rachmaninoff did). Was that an interpretive decision on your part? I'll check that! Thank you for the most interesting topic! It's about time I wrote another post on this forum, since a little more information on Rachmaninoff and his proximity to the pianola has come to light. This forum is not brimming with fresh postings every day, but I hope one or two Rachmaninoff scholars will take note in due course. The Rachmaninoffs moved to Dresden in November 1906, remaining there on and off until 1909, and living in a rented house at Sidonienstrasse 6. This was a street just off the main shopping thoroughfare of Prager Strasse, and not far from the Hauptbahnhof, the central station. You can find references on the web to another Dresden mansion where the Rachmaninoffs stayed in the 1920s, the Villa Fliederhof, and it is important to realise that these were not at all the same location, nor indeed the same area of the city. 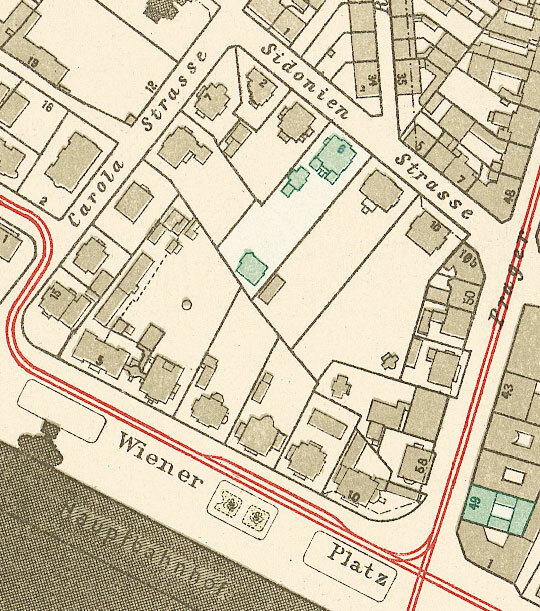 From the Dresden street directory of 1904, which is available online, it is clear that the main Sidonienstrasse building was split into many apartments, but there were also a garden house and an artist's studio in the leafy plot of land hidden away behind the scenes, and from Rachmaninoff's description of his new abode in letters to friends, it seems likely that it was to one of these, probably the garden house, that he moved his family in 1906. 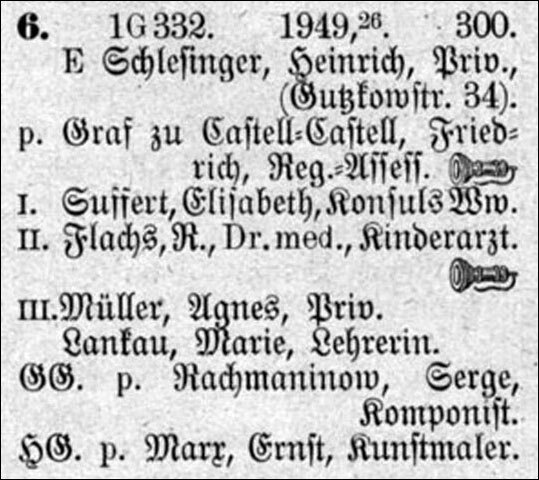 In 1904 the inhabitant of the garden house had been Franz Koppel-Ellfeld, the Intendant of the Hoftheater (the Semperoper) at Dresden, and a well-known author and opera librettist of the time, so it is easy to see how Rachmaninoff's opera connections must have played a part in finding the ideal location. The whole property can be clearly seen in the Dresden street map of 1911, where I have coloured it turquoise. Also coloured turquoise is a building at Prager Strasse 49, and we'll come to the reason for that in a moment. This complete area was destroyed, like most of central Dresden, on the night of 13/14 February 1945, when the Allied bombing caused a firestorm to annihilate much of the city, but it still existed in 1944, when the following aerial photograph was taken. 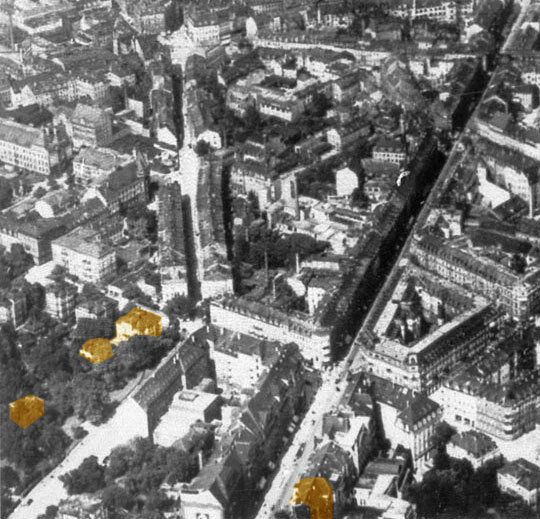 The photo points more or less due north, and I've coloured two locations in sepia, the one on the left being the main Sidonienstrasse building, with the two garden properties behind it. It may be remarked that nos. 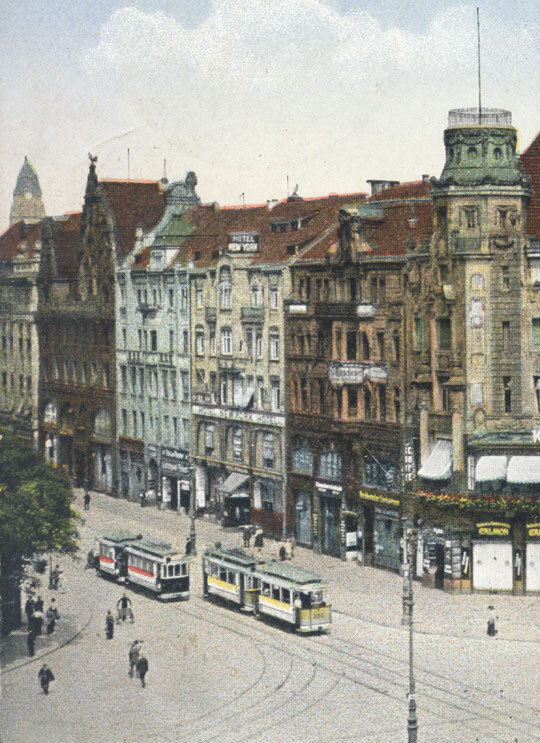 8 and 10, Sidonienstrasse had by this time been replaced by further commercial development, so that Rachmaninoff's former Garden of Eden was by now rather less hidden. In view of the wartime destruction, the Dresden of today is very different, and Sidonienstrasse no longer exists to the north-west of Prager Strasse. Indeed, Prager Strasse itself has largely disappeared and been replaced by St Peterburger Strasse, which heads north in a similar but slightly more easterly direction. Don't be deceived by Google Maps, which, if a street number does not exist nowadays, still displays an orange button in a default location at the end of the street, and even produces a photograph of any old building it feels like. Choosing Sidonienstrasse 6 in Google Street View produces the same building as Sidonienstrasse 16, 26, or even 106! The other sepia-coloured building in the photograph (turquoise in the map) is also very important. It is at the southern end of Prager Strasse, where it used to join the Wiener Platz, diagonally opposite the main entrance to the Hauptbahnhof. Prager Strasse was rather like Oxford Street to us Londoners, and it is a testament to the thoroughness of the city's destruction that it no longer exists, though I suppose the communist leaders of the former East Germany might have been rather pleased to have had the opportunity of replacing it with a more Russian-sounding thoroughfare. At any rate, the other highlighted building is Prager Strasse 49, and roughly in the summer of 1907, the Choralion Company, the German subsidiary of the Aeolian Company, manufacurers of the pianola and other roll-operated instruments, established a small showroom and retail premises there. It must have been a wonderful location, since everyone coming out of the station more or less had to pass it. No doubt that included the Rachmaninoff family, who, on the return from one of their sojourns at Ivanovka, might perhaps have remarked on the new establishment, even if they were passing slowly by in a horse-drawn cab. Here is a clearer view of the building, housing two or three individual shops, just to the left of the tower on the corner, which latter formed part of the Kaiser Café on the Wiener Platz. The more general point here is how physically close Rachmaninoff was to the pianola between 1907 and 1909. The main showroom in Dresden was no more than two or three minutes' walk from his house. Nothing is written down and recorded, alas, but it would surely have been very strange if Rachmaninoff had not visited what was effectively a new showroom for pianos and allied instruments. In any case, we have his sister-in-law's recollection of his pedalling a pianola at Ivanovka, and I have to say, now that I have found out about Dresden, that the most likely purchaser of that instrument looks to me like Rachmaninoff himself. The timing of some of Rachmaninoff's early repertoire on pianola rolls also ties in with this period in Dresden. I have managed to acquire a large number of roll catalogues over the years, so I can be relatively certain in stating publication dates. The first four of Rachmaninoff's compositions to appear in an Aeolian Company Pianola catalogue were the Prelude and Polichinelle from Opus 3, and the Waltz and Melodie from Opus 10. These were all just about issued in the nineteenth century, given that the new century technically began in 1901. By the time of the July 1901 catalogue, several hundred more classical titles had been published, beyond these four of Rachmaninoff, so they were almost certainly in existence by 1900. 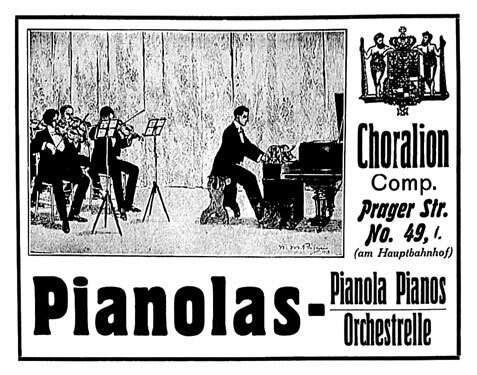 The Pianolas first went on sale in 1898, by the way. Not much changed between then and 1906, when the Rachmaninoffs first went to Dresden. The Elegie and Serenade from Opus 3 had been added, probably in late 1901 and certainly by the time of the July 1905 catalogue, and all six titles were also published in the Aeolian Company's Metrostyle series, with undulating red lines to indicate the use of the tempo lever. In case anyone thinks that the pianola was somehow more associated with Scott Joplin than it was with Rachmaninoff, let me reassure them that any special association with ragtime or dance music comes more from the tastes of present-day collectors than it does from the original period. Of course, all styles of music were represented in the roll catalogues, but serious music was definitely at the centre of the instrument's repertoire, as this advertisement from Dresden in November 1909 shows. Up to about 1906 all rolls for the Aeolian Pianola had been made in America, at the Company's factory in Meriden, Connecticut, but the market in Europe was expanding very fast, and somewhere between 1906 and 1908 a small roll factory was opened in London, in the Covent Garden area of the city, though initially only producing copies from American master rolls. In 1910 a much larger factory was built at Hayes, not far from the HMV factory, and a musical staff was engaged to produce new music rolls from scratch. Over the succeeding decades, it was London which provided the most interesting classical repertoire for the foot-pedalled pianola, and several separate roll-numbering series were introduced. An important technical development at this time was the agreement between player piano companies in Buffalo in December 1908, when an international standard for the new 88-note rolls was agreed upon. Prior to that date, most rolls had covered only 65 notes of the piano keyboard, losing about an octave at each end. It was the development of smaller and more sophisticated pneumatic valves that allowed rolls with smaller perforation sizes to be used, thereby expanding the range available in rolls of normal width, which was roughly 11 1/4 inches. But it should not be imagined that all rolls suddenly became 88-note, and 65-note remained the main standard for at least a couple of years thereafter. The Orchestrelle Company was the Aeolian Company's subsidiary in London, and its June 1910 catalogue of 65-note rolls bears witness to a sudden flurry of new Rachmaninoff issues. The most important of these, published no more than a month before the catalogue was issued, was a three-roll set of the Second Concerto, available in both standard and Metrostyle rolls, but also around the same time there were the first six Preludes from Opus 23, plus an additional arrangement of no. 5 (G minor) by Siloti, and three of the Opus 16 Moments Musicaux, nos 2, 11 and 16. Here's a musical example of one of these issues from around the Dresden period, a very simple 65-note roll of the Eb Prelude, Opus 23/6, which I played in a recent concert. Those who don't really know about the pianola should be aware that one has to play the instrument. It will not give you a musical result unless you work at it, since there are no inherent dynamics or rubato on such rolls. That said, it's clear enough to me that the rolls of the Concerto in particular are the most subtly arranged rolls of any standard foot-pedalled concerto published by Aeolian, and probably by any company. It might be that Aeolian in London had some particularly musical roll editor on its staff, but by far the most plausible explanation must be that Rachmaninoff himself had some influence in the matter. Sophia Satina, his sister-in-law, particularly remembered his playing the Second Concerto on roll at Ivanovka, so he must have been well aware of Aeolian's activities in this regard. And if he had the Concerto, there would have been no earthly reason why he should not have had the other rolls published at the same time. Alas, the Revolution no doubt destroyed every trace. For these rolls to have been published in late 1909 and early 1910, plans must have been well laid by April 1909, when the Rachmaninoffs returned to Ivanovka. Perhaps Aeolian in London was reacting to Rachmaninoff's own performance of the Second Concerto with the London Symphony Orchestra and Koussevitzky, at the Queen's Hall on 26 May 1908, though they may have been told to watch out by their colleagues at Choralion in Berlin, where the two Russians had given a similar, all-Russian programme on 23 January. So far no-one has been able to give me chapter and verse of Sophia Satina's recollections, so I cannot be sure from when her memory dates. But the most likely time surely has to be the summer of 1909, when the rolls might well have been in a state for the composer to have proofed and corrected them. That would also fit with another theory (well, dream!) of mine, which is that the Third Concerto has moments in it inspired by the fun that Rachmaninoff had with the pianola, and indeed the speeds he was able to obtain. As some readers may know, I performed the Third Concerto with the Brussels Philharmonic and Yoel Levi a few years ago, from rolls which I made from the score, and it was (of course!) a matter of honour to choose the more difficult ossia wherever one presented itself. During the first rehearsal, as we reached the very end of the Concerto, Yoel Levi stopped the orchestra and diplomatically suggested that I might be playing some wrong notes. I try very hard not to let errors creep in, though I am only human, but I was able to reassure him that, at the end of the coda in the last movement, there is indeed a quadruplet (as opposed to triplet) ossia, which I had chosen. Apparently no-one usually plays it, since it is simply too fast for human fingers. But not for the pianola! I believe Rachmaninoff warned people off trying to find dramatic programmes in his music, though he might have been reacting to some of the more lurid scenarios (senarios) invented for the C# minor Prelude in the popular press. But I do have the feeling that the Third Concerto to some degree mirrors his state of mind at the time it was being written. In particular there is a moment of respite in the last movement, where the pianist plays a few well-chosen and almost nostalgic chords, before everything once again takes off in a final rush. It has always seemed to me to reflect Rachmaninoff's one last glimpse of peace at Ivanovka, before resigning himself to the flurry of preparation for his impending American tour, with all the frenetic rush of the New World. In the same way, some of the scherzo-like passages, and some of the offbeat rhythms, seem to me to allude to the fun that can be had with dance music on the pianola, or from the novelty, to a bright and well-trained musician, but a novice at the pianola, of fiddling around with the tempo control in all sorts of different ways. For someone with such a sombre public visage, Rachmaninoff clearly had a wonderful sense of humour, and it is easy to see how a new pianola would have appealed to him. By June 1914, when the Orchestrelle Company published an enormous catalogue of both 65 and 88-note rolls, a number of Rachmaninoff's other works had been perforated, including Otto Taubmann's four-hand arrangement of the Isle of the Dead, the Variations on a Theme of Chopin, and accompaniment rolls of the Opus 19 Cello Sonata. These are by no means minor works for dilettantes to strum, either at the piano or the pianola, and it is almost inconceivable that Rachmaninoff's advice would not have been sought. As I mentioned in my previous posting, there happens to be written evidence of just such musical suggestions from Stravinsky, with regard to the Rite of Spring and Petrushka, simply because Stravinsky hoarded all his paperwork, but many other composers are known to have been involved with the player piano, and there is no reason why Rachmaninoff should have been an exception. It is only the current lack of familiarity with the instrument in classical music circles that leads to any surprise that this should be so. As a postscript to all this, I should say that I was in Lucerne last summer, since my wife manages orchestral conductors, and one of them was taking part in the Festival. While she was having meetings all over town, I took the ferry to Weggis and walked to Hertenstein, hoping to see the Rachmaninoff villa, even if from a distance. No such luck, since it is hidden away like Fort Knox, but I did at least say hello to my hero in a little public garden by the lake shore, where holidaymakers slip into the water and bask in the sun. No-one much stops to chat to Rachmaninoff, so he and I had a quiet half hour together, and I took the opportunity of asking him about the influence of the pianola on his compositional style. "Why, the answer lies in the music!" he replied, "now, why don't you take my photograph?" So I did. My camera didn't like the overpowering sunshine, but here he is anyway. Thank you, Sergei Vassilievich. dear Pianola, what a wonderful post about SVR in Dresden and the pianola, thank you so much!! All kind of facts I did not know about came to light here. Thanks again. One more tiny piece of documentation regarding Rachmaninoff's sojourn in Dresden has finally come to light on the web, in that the Saxon State and University Library has recently put one or two more city address books online. Here is Serge, the Komponist, in his GG (Gartengebäude) at Sidonienstrasse 6, in the volume for 1908. Presumably the census was done in late 1907, but there is no way of knowing such details. A word about the floor numberings. In 1908 the Germans still regarded the first floor as the one above ground level, just as we still do in the United Kingdom. What we call the ground floor was known in Germany as "parterre", which accounts for the "p" next to Rachmaninoff's name. Presumably his garden apartment was a separate, single-storey building. I´ll visit soon Lucerne and I want to visit the monument that appears in this Forum (posted by "pianola") and its located in Hertenstein´, Weggis. I know that unfortunately, it´s no possible to visit Villa Senar..but, Can somebody tell me where is exactly located in the map the statue , so I can reach it?.... Thank you very much!! I´ll visit Lucerne soon and I would like to know if somebody can tell me where is located the Rach´s statue that appears in this Forum (posted by "pianola")... I know that is in Hertenstein, Weggis but , somebody knows where is located eactly in the map, so we can reach it?...Thank you! !